For summer 2018 Icelandic Mountain Guides (IMG) organized their 12th expedition across the Greenland Glacier, the world’s second biggest sheet of ice. We celebrate Frithjof Nansen´s great achievement in 1888 when he made the first crossing of the Greenland Ice sheet. We did our best to follow his skitrail, even though the actual one has long since disappeared. 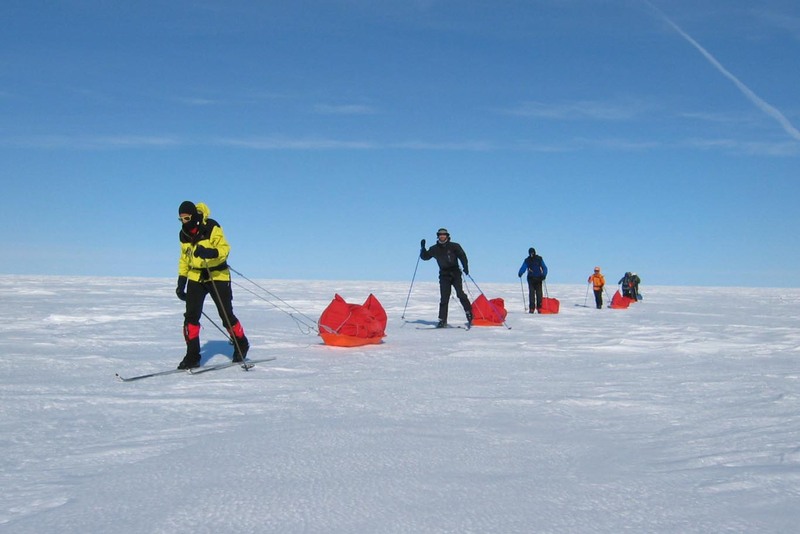 The entire expedition took up to 29 days in total. So far, IMG’s success rate is 100%. We would do this again with joy. 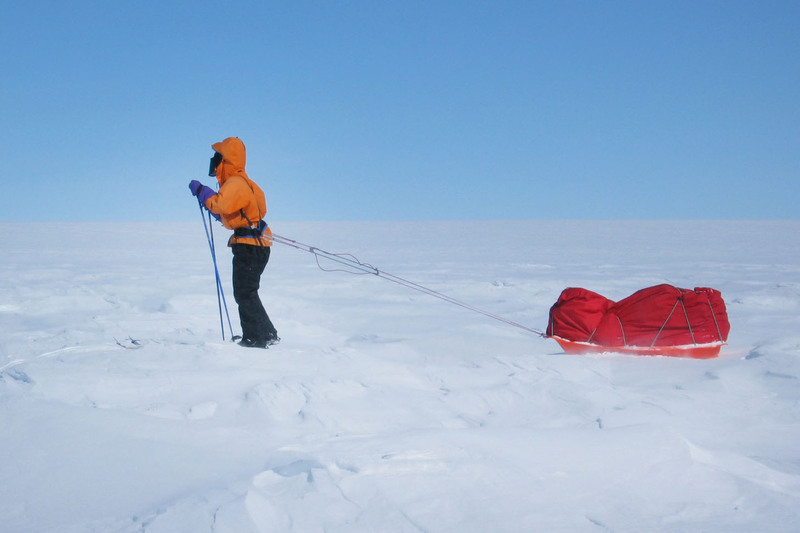 It takes about 10 - 15 days to climb up to the highest part of the Greenland ice sheet, at ~2300m. From there it takes around 6 – 9 days to ski down the west side to reach terra firma at the top of the Austmanndalen valley on the western edge of the ice sheet. All in all we estimate spending from 16 to 24 days on the ice sheet. 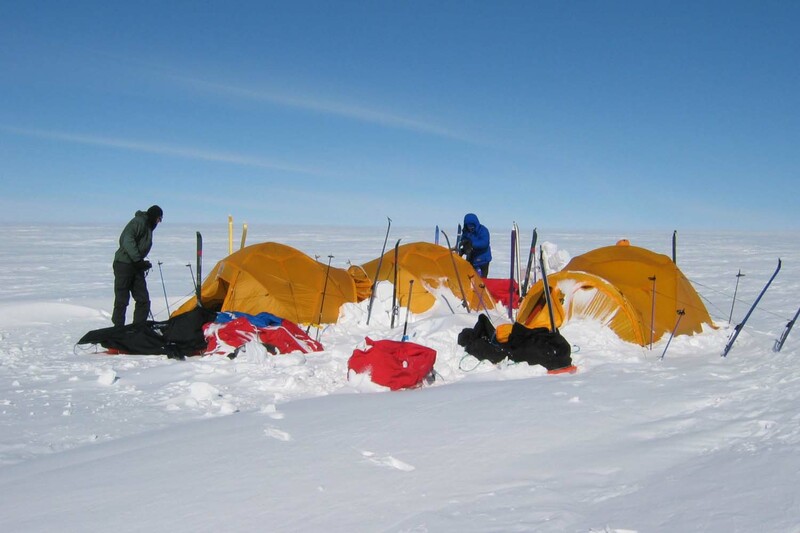 Depending on the snow conditions and the weather we encounter the expedition can last from 24 - 29 days in total including transport at the beginning and the end For any back country enthusiast this is the ultimate expedition, where one needs to overcome several challenges, and not all of them physical! The expedition begins at Reykjavik city airport with a flight to Kulusuk, Greenland and then a helicopter transfer to Tasiilaq, the capital of East Greenland. The group will stay in Tasiilaq for one night sorting out equipment and food and dealing with the final preparations before setting out. From Tasiilaq the group will set out in a boat south along the coast to the small bay of Umivik the place where Nansen started his expedition. If we are lucky we will not have to carry our gear a long distance before the skis will take over for the next 450 km (280 miles) or so. 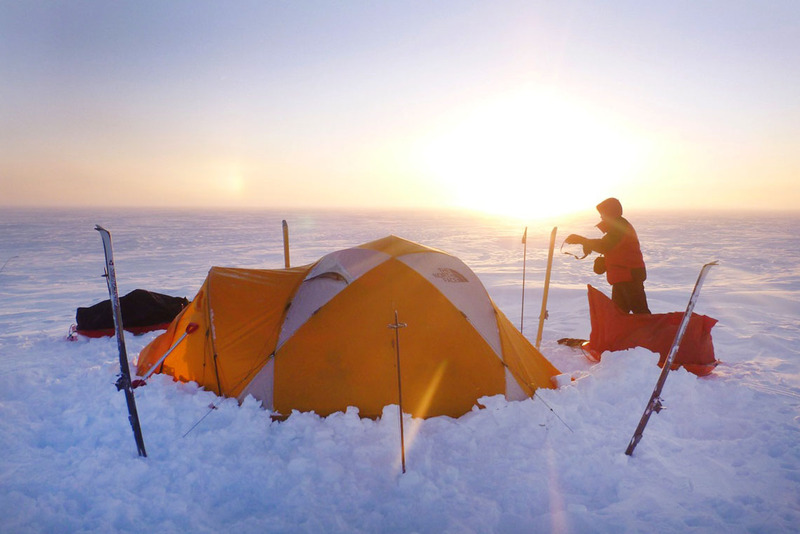 It takes about 10 - 15 days to climb up to the highest part of the Greenland ice sheet, at ~2300m. 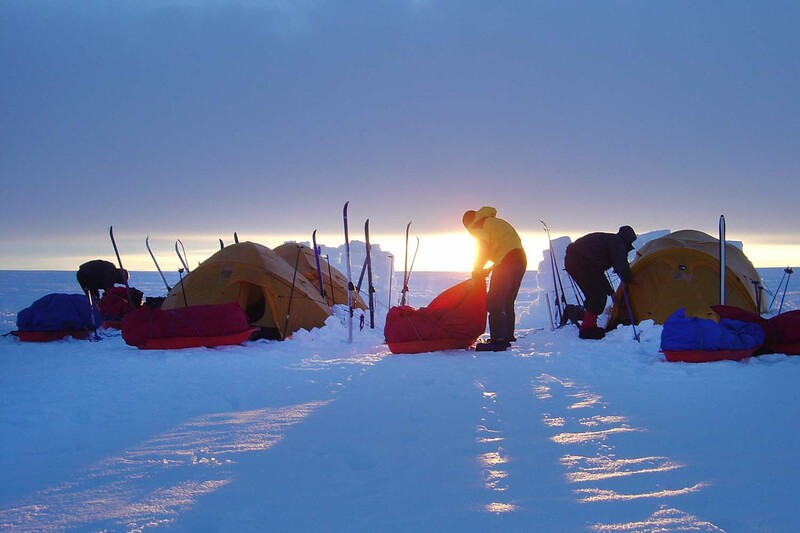 From there it takes around 6 – 9 days to ski down the west side to reach land at the top of the Austmanndalen valley on the western edge of the ice sheet. All in all we estimate spending from 16 to 24 days on the ice sheet. Before getting off the ice and getting ready for the last part of the expedition, the hike down the Austmanndalen valley, a helicopter will appear to fetch the luggage we will not be needing for the last 4 days of our adventure. 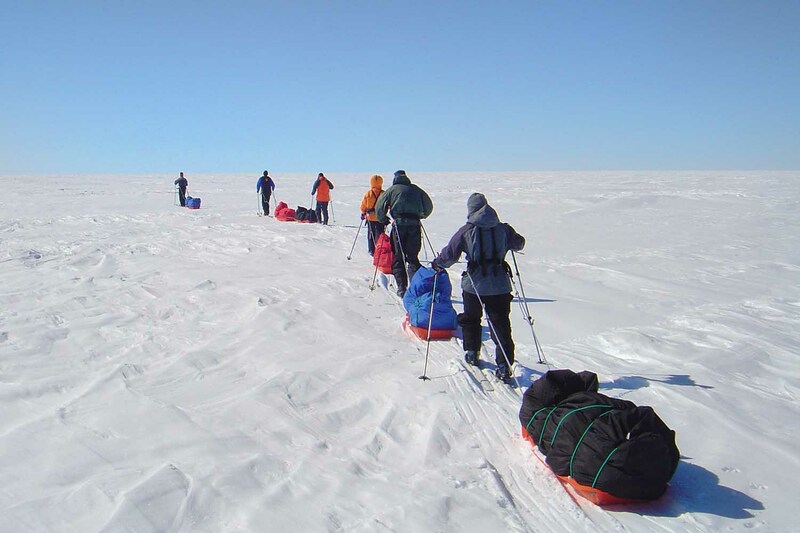 This hike will give our expedition a new dimension as the landscape is quite dramatic providing brilliant contrasts to the endless snows of the ice sheet. The fauna of the area is also truly remarkable. Reindeer, muskoxen, snow hares and arctic foxes can be seen in big numbers. 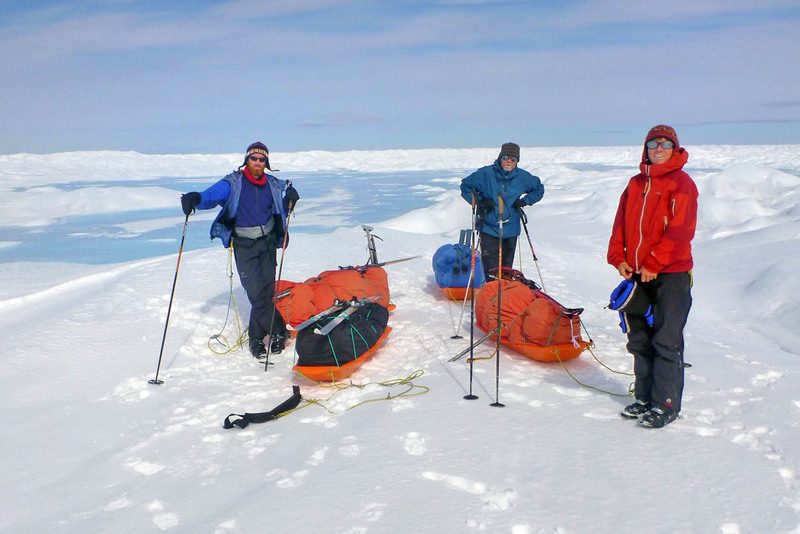 Four participants are needed to confirm the expedition (or there is a supplement for fewer participants). Day 0: Preparatory meeting in the morning with the expedition leader. Exact time and location to be announced. Day 1: Flight Reykjavík – Kulusuk – Tasiilaq final preparation and the necessary inspection of gear etc – overnight in Tasiilaq guesthouse. Day 2: Boat transfer south along the rugged coast to the small bay of Umivik, or another more suitable place to set out from on the skis. Day 2 – day 12/17: Skiing up to the summit. 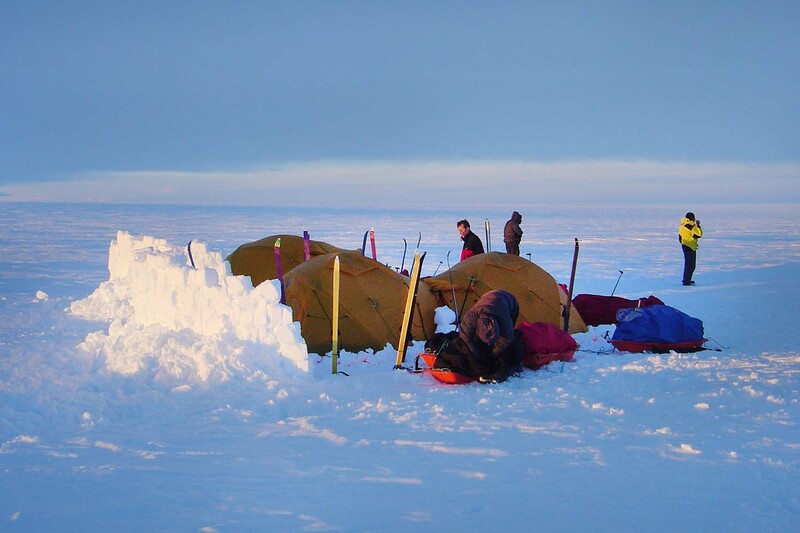 It takes about 10 - 15 days to climb up to the highest part of the ice sheet on this route, topping off at 2500 m.s.l. The gradient is gradual and the use of skins make sure that the skis move us forward. Day 12/17 – day 18/23 Skiing down on the west side of the ice sheet and to the top of Austmanndalen Valley. Day 18/23 – day 22/27 Hiking down the Austmanndalen Valley to the shorefront where a boat awaits to bring us back to civilization, to Greenlands capital Nuuk. Day 22/28 – day 24/29 We have one full day to adjust to daily life after the routine of the expedition, in this quaint capital before flying back to Reykjavik, Iceland.